In a pan, heat olive oil and add in the sliced garlic. When starts to turn golden, add shredded carrots. Cook stirring frequently for about 2 minutes. Add bell peppers, canned tomatoes in juice, lemon juice & water. Season with a little salt, add the cumin and coriander and mix. Lower the heat to medium. Season the fish and lay atop the vegetables in the pan. Place tomato circles atop the fish and cook for about 4-5 minutes. Place minced cilantro on top of the fish, cover pan with lid and let cook for another 2 minutes. It's ready to serve immediately. Make sure you have plenty of bread to soak up the sauce. Wash and dry the short ribs. Season with salt and pepper. Mix together the cumin, cinnamon, and ginger. Rub onto the short ribs. Set to braise on a foil covered baking sheet into a 400 degree oven for 20 minutes. 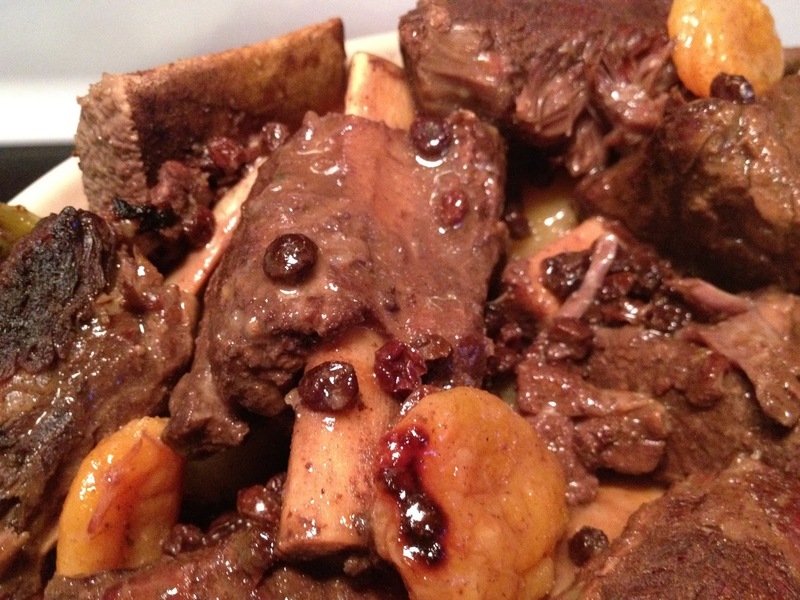 Lay the braised short ribs into a dutch oven. Lay the onion, carrots and potatoes atop. Mix chicken stock with honey and red pepper flakes. Pour over the contents of the dutch oven. Cover with lid and cook at 350 for 3.5 hours. Remove meat and vegetables into a separate container. Separate the fat from the remaining sauce, and discard. The sauce remaining add to a large pot. In two cups of stock add the flour and mix until no lumps are remaining. Add the mixture to the sauce in the pot. Add in currants and apricots. Set the pot to come to a boil on medium heat, stirring occasionally. Cook for about 15 minutes. Add in the lemon juice finish it off. Pour the sauce over the short ribs and vegetables and serve immediately. The changes of finishing the sauce off separately come from the issue I had with the sauce starting to burn as soon as flour is added. This is due to the single heat source from the bottom (stove top), which is the other driver to moving the whole recipe into the oven. I grew up eating these, and just discovered my hubby was deprived his entire childhood. What a shame! I'll have to keep making them to make up for all the lost time. Make the filling by heating the oil in a pan on medium-high heat. Add in the chopped onions and fry until they turn golden/caramel color. Add in the mushrooms, and cook while stirring for 3 minutes. Add in the meat, and fold in, stirring slowly. Cook until beef is ready, about 5-7 minutes. Season and set aside to cool. Boil peeled and cubed potatoes in salted water, until fully softened. Drain and mash with butter, until smooth. Sift in the flour and add in the egg. Mix and season with salt and pepper. Let cool completely. Spread flour on a working surface. Drop a heaping spoonful (a wet spoon helps) of the potato mixture and flatten a bit, and flip over. Flatten into a circle about 1/4 inch in thickness. Drop 1-2 teaspoonfuls of the filling into the center of the circle. Carefully pinch the circle together and roll in flour. Set aside and repeat until all your dough/filling is used. 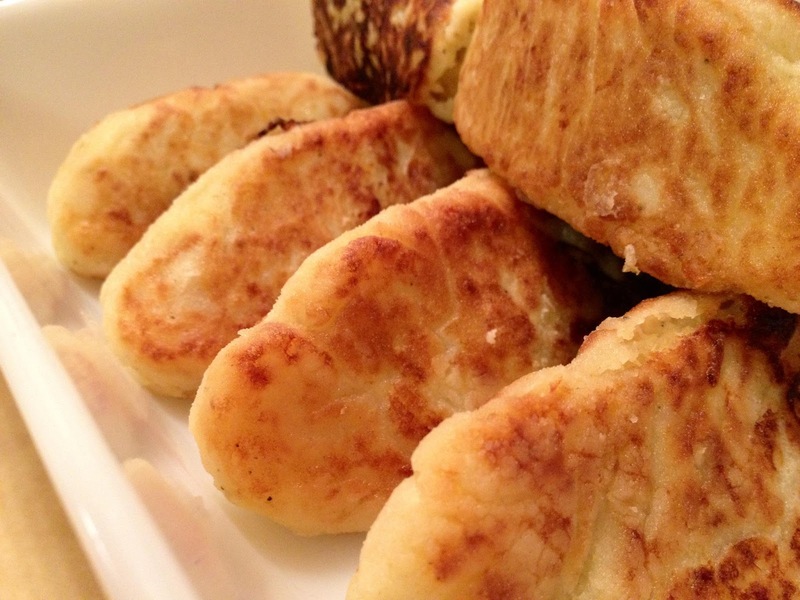 Fry in batches (with oil), on medium-high heat until a golden crust forms, on each side.